Discussion in 'Classic Menswear' started by smfdoc, Jul 14, 2016. Someone here needs to buy those. They look like they were worn 2 or 3 times max. I added them to my watch list. Model 5760 “The Dunday” - Page 15 in the 56-57 catalog. They are made on the 0 MacGregor last (I own MacGregors - one of my favorite vintage shoes). I find no further mention of a 5760 in later catalogs, so these are a seriously vintage pair. And it looks like they sold, so I hope someone here got ‘em. Already gone. They lasted 2 hours and 20 minutes. The Hy-Test shoes arrived yesterday and they were exactly the opposite of the MacNeils I recently purchased. Where the MacNeils were much better than they looked, these were worse. Now, to be clear, they had only been worn two, maybe three times, but the combination of wax/finish weirdness (more on that in a second) and neglect meant they needed a lot of attention. They are a super weird shoe: they are basically a long-wing dress shoe built like a work boot (which isn't surprising since Hy-Test is a Wolverine brand). These are a foreman / worksite management shoes from (I'd guess) sometime in or around the 1970's, complete with steel toes. I had to strip that crap off before I could even get some conditioning done; I used a lot of isopropyl to remove it and then had to do a lot of leather treatment as the shoes were board stiff from being completely dried out. I also had to sort out a redneck repair that was done to the interior (the heel to arch cushion in the left shoe had been reaffixed using some questionable contact cement). I then applied a bunch of AE Bourbon cream polish (which was an exact match) and replaced the laces (I had only a spare set of blue laces). I was pretty concerned that these would prove unbearably uncomfortable, but interestingly enough, they aren't bad (once the leather was properly treated and no longer stiff). 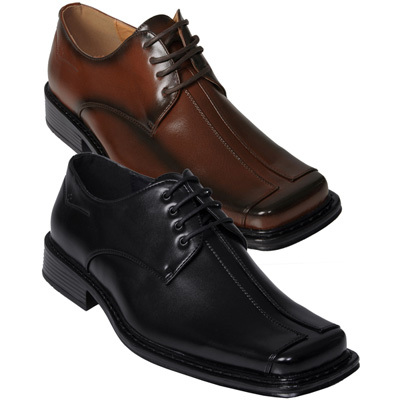 As mentioned, while they might look entirely like a conventional dress shoe, they actually feel like a quality work boot, which is basically what they are. Everything about these shoes is built to survive, not to last (a very different ethos). The sole is just a single massive sole attached to a massive vinyl Goodyear storm welt, the grain leather is of okay quality but is thick, the detailing is also only okay, but you could drop very heavy stuff on your foot and not feel it. Despite feeling like I was wearing a boot and not a shoe, I quite like these - they are definitely an oddball, the likes of which really doesn't exist anymore, especially with all the Union stamps and regulatory compliance info on the inside. The strangest thing has been peoples reactions: I've never gotten multiple comments in one day about a pair of shoes before, but for some reason three relative strangers made a point to say how much they liked them, from the plumber to the lady at the local deli - apparently the laces were a good idea. Thanks for the review. I find coloured laces always gets attention. Especially from the ladies. I guess it's easy to reign as king when my competition is wearing squared toed Aldos, or Skechers. These shoes make it easier to kill bugs running along the baseboard. ..And for running from the dance floor to snorkelling home. I missed the joke. Can it be explained without getting anyone upset on a warm Thursday evening? Not vintage, per se, but these e-thrifted shell cordovan loafers just arrived. Good question. If anyone knows the answer... @mariusscott ? 2 guys I work with were wearing shoes very similar to these today. They make fun of my "old shoe collection". There is little hope for the world. 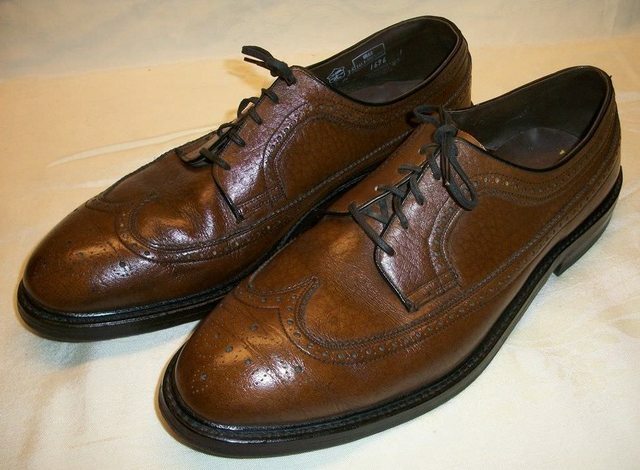 Vintage Florsheim antelope from Marius Scott. I like the texture and the open vamp to the narrow lace closure. Cotton chinos and linen popover from Spier and Mackay. JCrew Factory linen cotton jacket.